GCL Beehive # 20: I'm not scared! Scary things stalk the streets this month, demanding sweets/candy with menaces. Luckily I'm not frightened of vampires, ghosts or witches, and the local kids haven't worked out what I would actually find scary. With some people it's spiders or snakes, for others clowns or growing old. I hope that none reading this has Sesquipedalophobia or, worse still, Panphobia. So what does frighten you? At the other end of the scale, what's your favourite family joke? 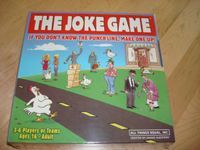 Or at least, a joke that you tell and your children find funny - for some reason they tend to groan at mine! There are games you love. There are games you hate. There are games you are indifferent to, but that would be a dull category, so let's leave it out. 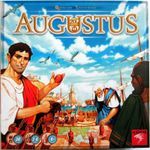 So, which game(s) do you have a feeling you should like (high up in the rankings for example) but really don't? And which game(s) do you love even though you know they are terrible, or at least have a low popular rating? We had a half term break last week, it was fairly wet and we didn't go away, so there was lots of gaming. The one day we did go away was an exciting trip to the dentist, which is in Edinburgh. This is a bit of a trek so we tend to make a day of it, always including a visit to our favourite Fair Trade cafe for a full Scottish lunch. 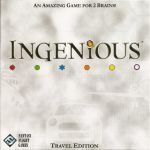 Sitting around in the dentist awaiting your turn is not exactly fun, but numerous games of Ingenious: Travel Edition and Duck, Duck, Bruce kept us entertained. Other games with the children during the week included Boggle, 7 Wonders, Lord of the Rings: The Confrontation, Ticket to Ride: Europe, Catan, River Dragons, Diamant and Pirate Island. In further good news I managed to meet up with another couple of gamers in the Scottish Borders, who braved the foul weather to come to our house for the evening. It went very well and a return engagement has been booked in. We played Billabong and Ticket to Ride: Europe. Helena and I also played Race for the Galaxy (numerous times), Thurn and Taxis and even gave the brain-straining Neuland another go along with our perennial favourites Agricola and Agricola: All Creatures Big and Small. You can view my week in greater detail here: Item for Geeklist "What Did You Play This Weekend? 10/21/2013" . Innovation x 3 (NEW) - Fun chaotic game which I am sure will get more plays! Guildhall: Job Faire x 3 (NEW) - the new roles give the game a totally different feel. Can't wait to mix and match with the roles from Guildhall! 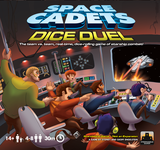 Not many games with the children as it was still term-time, but over the weekend we had a couple of gaming friends over, and gamed solidly from Friday lunchtime through to Monday lunchtime. The Monday games will come in next week's list, but there were an impressive number of games over the weekend. I also finally played Imperial, which we've owned for years, but I've never actually played, although my husband has. This week is half-term so I expect there will be some more gaming with the kids, although so far we've been busy with other things and only played one. 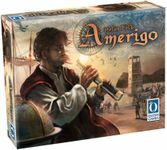 I received Amerigo just in time to get a play in with the kids, and then get it to one of our local Game Nights where I could teach it. I have no idea yet where I will eventually rate this, so a -7- will do as a placeholder for now. First impression is good. Fun and interesting game...but awfully long. Length is what keeps Bora Bora from the table, and I wonder if that will be the case with Amerigo as well. We will see. The Feld game that gets the most plays in my house is Bruges, and that has everything to do with playing time. Antony (14) is requesting Bruges of late. Awesome. I haven't posted my games played in a while so this is going to be over the last month or so. 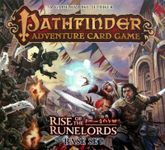 Pathfinder Adventure Card game with the game group. I like it but there is quite a bit of setup involved. I'm not sure if this is going to work as a game with the boys. I don't think Andrea would like it either. Pathfinder the RPG. 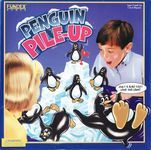 I have been playing this with the boys some (limited by their attention span) and also an online message board campaign. (We are dwarves reclaiming an old mining complex.) But for the first time in over 20 years, I actually sat down at a table with adults and played an RPG. It was part of Pathfinder Society which has self-contained 3-4 hour sessions so it is really good if you can't commit to a regular group. I played an elf alchemist and got to have fun throwing bombs. We had to go to Irissien, the land of eternal winter ruled by a witch queen (sort of like Narnia in the first book) and deliver a macguffin to a guy. We battled some goblins and a blight druid and freed a bunch of slaves. I had a great time. Walk the Plank. Our soccer coach who is a young guy I know from the game store, got the store to sponsor our end of year party. They gave each player a copy of Walk the Plank, so we tried it out. We had fun but I thought the game was pretty forgettable. You're playing 3 programmed action cards at a time and trying to push the other pirates off the plank. As I hinted in last week's Beehive, I purchased Love Letter at the local game con, due at least in part to comments by other Beehivers. and, in two weeks, we've played it 7x already - which certainly qualifies as a hit here. (My 8 year old daughter particularly likes it.) I can see why some folks don't find it that interesting, as, after you figure it out, there are many situations where the correct best play is reasonably obvious. But, it takes a while to get to that point, and it's a fun ride while getting there. Also, it does feel like your guesses and deductions mean something (and they certainly do, sometimes). I like that the cards have differing levels of usefulness, depending on when you are in the round. Finally, I think the theme does come through, at some level - we call the cards by 'she' and 'he' as we play. Met up with my friend and his gaming buddies and we played 2 games of Forbidden Desert. It was a fun game, even though we lost badly. Well, I usually find it more fun to loose co-op games than winning them, but this is a promising game. I also taught them Puerto Rico. They had played San Juan a few times, but my friend bought Puerto Rico because he felt it was an obvious follow up. It took just over two hours!